60 Quick Knitted Toys is filled with creative and cute toys that are perfectly irresistible! Knitters will love creating this collection of 60 cool toys, which range from tools like a saw, hammer, and screwdriver to a ballerina doll. Whip up a menagerie of stuffed hippos, owls, foxes, and monkeys; games like a jumbo knitted tic-tac-toe board and penguin bowling; or a unique medieval set that includes a king, a queen, an adorable dragon, and a building-block castle! 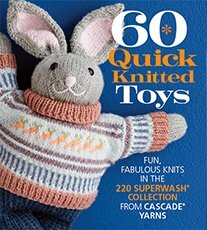 From stuffed animals to hand puppets, 60 Quick Knitted Toys is a treasure trove--or toy chest--bursting with inventive and irresistible patterns to knit! Each adorable pattern creates fun and the ease of 220 Superwash® with its enormous color palette will give an array of possibilities for every delightful project found in this wonderful book.